*Valdler is a professional manufacturer and trader,development and production of kinds of wedding accessories.We have been sourcing high-quality raw materials for our products since the establishment of our own company and factory.Valdler is our registered trademark.Valdler CO.,LTD.will enjoy a splendid future with you throughout the world. These can instantly charge up the user? ?s mood and instigate a party-mood in them. *This flower crowns aren? ?t just for fairies, princesses, or little girls. Everyone can wear this flower crown! *These beautiful accessories are very easy to make and wear. Plus, you? ?ll get to go frolic in a field somewhere. 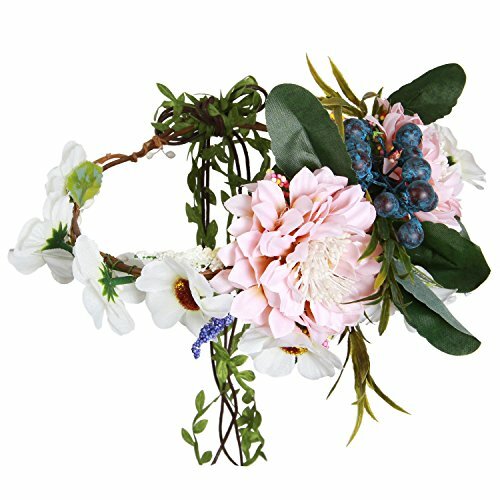 *This flower crowns made out of handmade silk flowers but when one looks at it they look like real flowers with the same soft and velvety texture. If you have any questions about this product by Valdler, contact us by completing and submitting the form below. If you are looking for a specif part number, please include it with your message.